A team of materials science researchers from the US may have just made the first breakthrough that could make so-called “soft matter” a viable data storage medium — at some incredible storage densities, too. According to the new research, microscopic particles suspended in liquid could be used to encode the same 1s and 0s stored on solid hard drive platters today. They theorize that clusters of these particles could one day be used to store up to 1TB of data in one tablespoon of liquid hard drive. The term “soft matter” is almost as fuzzy as it sounds. It can refer to liquids, foams, polymers, and even some biomaterials. What all soft matter have in common (and the important bit here) is that they have predictable physical behaviors at various temperatures — that usually means changing shape on the molecular level. The team behind the liquid hard drive, led by Sharon Glotzer and David Pine, used a type of colloidal suspension of specially designed dimpled nanoparticles. Being a colloidal suspension means the particles are not permanently dissolved in the solution and retain their expected properties (i.e. soft matter). So what happens when you heat the liquid up? Yes, the particles reorient themselves in predictable ways. The nanoparticles used in this study were arranged in groups of four or more with a central sphere acting as a binding point for the cluster. Adding thermal energy to the system causes the nanoparticles to shift around on the surface of the central sphere and adopt different configurations. 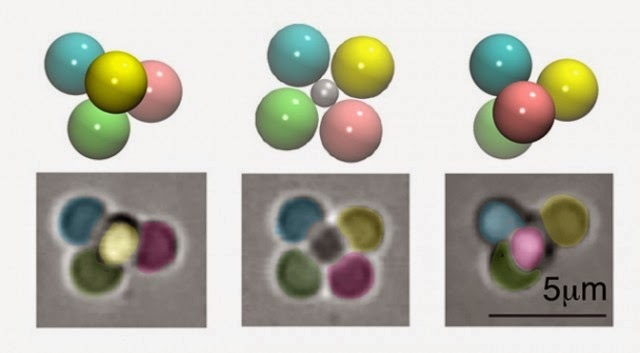 The entire assembly is only about 5 micrometers across, but the team was able to visually verify the change in conformation (a scientific word that describes the arrangement of atoms in a molecule). colloidal_clustersThe leap from neat little dancing nanoparticles to, “wow I can store data in this bottle,” is that the simplest four-particle cluster has only two distinguishable configurations other than the default unstimulated state (that’s the center one in the image at the top that has all four lobes spread out flat). These other two shapes are similar to chiral molecules — that is, they’re made up of the same constituents, but can’t be superimposed on the other (they’re always asymmetric, no matter which way you turn them around), which is why you can tell them apart even if they’re floating freely. These two states can be read as a 1 or a 0, thus each cluster of nanoparticles encodes a single bit of data. The team has dubbed the liquid a digital colloid. Of course, this is just the first step. Someone still has to find a reliable way to lock the clusters into the right shapes across a larger volume of liquid and then read that data quickly. Counting bits with a microscope probably isn’t going to cut it. Likewise, IBM managed to stored a bit in just 12 atoms, but it’s just not feasible to read and write data with a scanning tunneling microscope. The liquid hard drive team believes that data density could be very high with the right techniques, which is where they got the 1TB per tablespoon figure [DOI: 10.1039/C4SM00796D]. Maybe it’ll come to pass one day, but right now hard drives will remain solid.